"Charles Crider and wife Dolly were there also. In addition, Mike Steele (Sheila's brother) and his wife Sandra were also there. St. Timothy Lutheran Church just happens to be their church. How neat was that!" 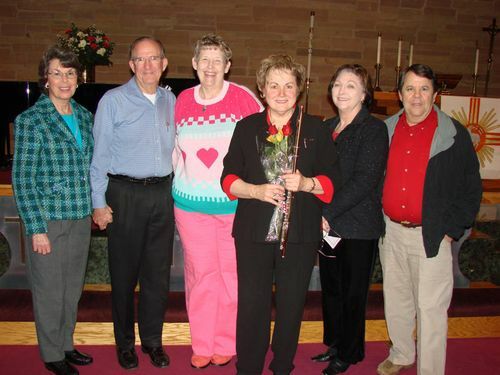 L-R: Dolly/Charles Crider, Jody Bugg, Beverly Frankinson Allison, and Sandra/Mike Steele (Sheila Steele Howard's brother). Jody continued, "Beverly and I were supposed to go to dinner after the concert, but she was called back to Galveston for a symphony rehearsal. We are going to lunch on the 25th." Jody explained that Beverly lives in Houston, but she plays in the Galveston Symphony Orchestra. The orchestra called an unscheduled rehearsal for Sunday night, so she had to leave right after the Valentine's Day concert to get to Galveston for rehearsal, then drive back. A long day for her.